News that Boris Johnson has been named an “adulterer” in divorce papers comes as a shock to anyone who wakes each day, quints at the sun and asks, ‘What the bloody hell is that?’ To the Sun Johnson’s penile adventures are an alliterative tale of of ‘Bonking Boris”, a “long-suffering wife” called Marina Wheeler and 30-year-old “Tory aide” Samira Mohammed. No, only joking. The alleged other woman is called Carrie Symonds, and she’s not wearing a burqa because we can see her face on the Mail’s front page. In the Sun we see photos of Johnson in his garden. He’s drinking from a mug – a metaphor perhaps – and looking “grim-faced” at his phone. Both pictures are credited to Simon Jones, aka “Sun photographer Simon Jones”. Might they, you know, be staged? “Explosions aside, Boris is still The One,” states Trevor Kavanagh three pages on in the paper., not exactly discounting the idea that the Sun is presenting the philanderer in a good light. 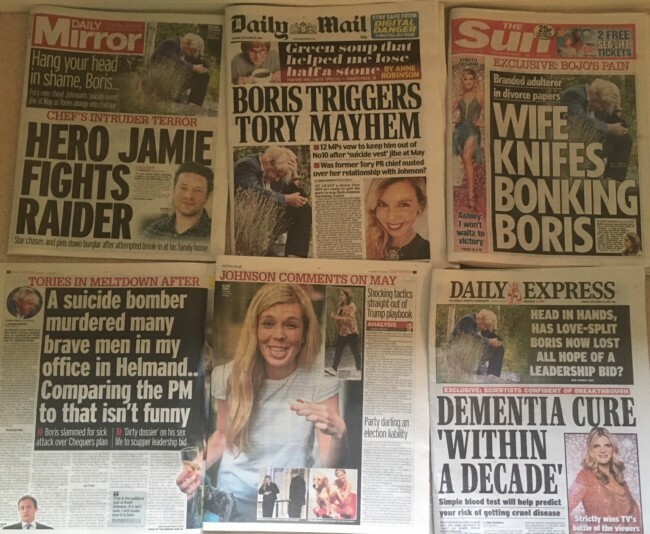 The photos also appear in the Mirror, but it’s main thrust is not into Carrie Symonds, but Johnson’s Mail on Sunday column in which he said Theresa May had “wrapped a suicide vest around the British constitution” and handed the trigger to Brussels. A few Tory MPs are lined up to say how revolting that is. Amid the “fury” the Mirror says it asked one Tory MP “if Mr Johnson had put a bomb under Mrs May’s leadership”. I see Tory MP Tom Tugendhat’s horrific tale of a suicide bomber who maimed and murdered many in the courtyard of his office in Helmland, and notice the bomb detonated below then British Prime Minister Margaret Thatcher, which killed five Tories, including one MP, and permanently disfigured many more. But what’s that? “Show us the totty!” Ok. The Mail obliges with five phots of Symonds – a “fun-loving blonde”. She is “glamorous” – and what more speaks of glamour than shagging Boris Johnson; maybe finding a pre-loved glamour magazine in a bush? – a “Tory party cheerleader”who tweeted as her name rode high on the news cycle: “Sea otters have the thickest fur of all animals.” To say nothing of their pockets – an otter’s pocket being something Johnson finds irresistible.